(MP019). W L Wyllie (1851-1931). Etching, signed. Standard size: 7 x 5 ins (18 x 12.5 cms) approx. That Wyllie chose this brave ship for one of his classic etchings is no surprise  he loved stories of heroism as did the artist’s admiring public: they took CHESTER and Boy Seaman Jack Cornwell VC to their hearts despite the disappointment that Jutland had not proved a conclusive victory at sea. 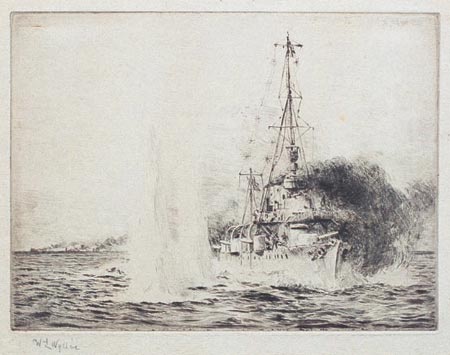 The etching is featured in More Sea Fights of the Great War published by Cassell & Company in 1919. For a portrait of Boy Cornwell at his post in his gun mounting please see MP177 ("Boy Cornwell") and see also Maritime Originals (bar at top of Home Page) for "The Battle of Jutland" where HMS CHESTER's fight is explained in the wider context of the battle as a whole.